One of the first things I noticed when I began working out regularly more than a year ago was how it affected my mood. I was all gung-ho when I started (there I am all smiles learning how to do a proper squat) but about two weeks in I lost my motivation. Andy Wight, my strength coach, had already warned me that it was normal —a lot of people will give up about then. I’d made the commitment and was writing about it here on the blog so forced myself to show up. One day, in particular, I felt more than unmotivated. I felt down. I can’t remember why, but I couldn’t get out of my own way. I almost canceled but didn’t and that’s the day I learned that my exercise routine had a profound effect on my mood. I arrived with no drive, no energy, no joy — all negativity. Andy didn’t give me a lecture, he simply put me through my paces. When I left, I realized that I felt great. Since then, if I’m feeling low, I look forward to working out because I always feel better. If I can’t make it to the gym, just going for a walk or doing the treadmill can improve my mood. The researchers, who were with the Department of Physical Education and Sports Sciences at the University of Limerick, Ireland, said that better quality clinical trials should be done before drawing any firm conclusions. Andy says he’s seen the positive effect strength training can have. 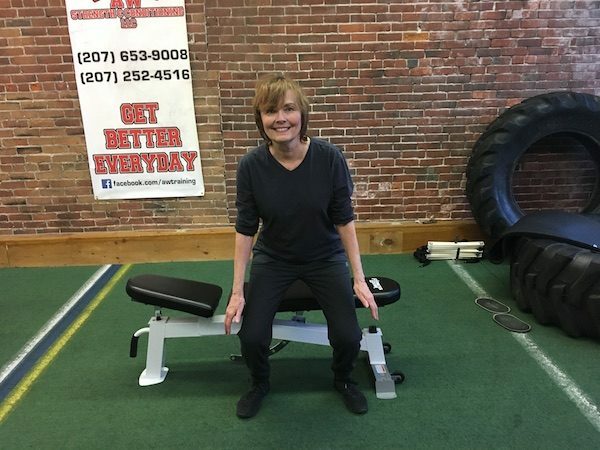 I have had clients experience a change in their mental status from strength training,” he said. “Whether it is related to depression or not, people I have worked with have seen a noticeable difference in their day to day lives. I see it more as confidence and self-esteem building when people strength train. When clients lift weights they never thought they could do or perform an exercise they have never done, the sense of accomplishment is overwhelming. Once someone has accomplished a few small goals, it opens their mind to doing more activities and having new experiences. That is where I see people lower their level of stress and/or improve their level of depression. It can be a real challenge to do any kind of exercise when you’re feeling low. If I hadn’t started posting about going to the gym, I might have given up that day I wasn’t feeling so great. I guess I felt a bit guilted into going, but I sure am grateful. Whatever works! The key is to find something that you enjoy doing. There are lots of suggestions here on the Catching Health blog and lots of pictures of motivated people feeling really good about themselves.